Pachygaster piriventris spec. nov., a species of soldier flies from the Oriental region, is described. The main characters of adults are figured (flagellum, abdomen of both sexes, male genitalia). Larva and puparium of the new species have been studied and figured in detail as well. Relationships of the new species and P. annulipes Brunetti as well as three Oriental species of Abiomyia Kertész are discussed. Biological notes are given and compared with the biology of other stratiomyids living in bamboo. Pachygaster piriventris spec. nov., eine neue Waffenfliegen-Art aus der orientalischen Region, wird beschrieben und wichtige morphologische Merkmale der Imagines abgebildet (Kopf mit Flagellum und Abdomen beider Geschlechter sowie die männlichen Genitalien). Larve und Puparium werden detailliert untersucht und abgebildet. Die Diskussion der taxonomischen Stellung der neuen Art erfolgt anhand des Vergleichs mit P. annulipes Brunetti sowie mit den drei orientalischen Arten aus der Gattung Abiomyia Kertész. Es folgen einige Notizen über die Biologie der neuen Art und ein Vergleich mit anderen Stratiomyiden, deren Larven ebenfalls im Bambus leben. The chloropid fly Olcella quadrivittata (Sabrosky) was found feeding and mating on staphylinid prey of the asilid Proctacanthus milbertii Macquart in Ontario (Canada). Kleptoparasitic and mating behavior is documented by photo. The same species of Chloropidae has been observed on hemipteran prey of Mantis religiosa (Linnaeus). Olcella quadrivittata is recorded for the first time from Canada. Die Chloropide Olcella quadrivittata (Sabrosky) wurde bei der Nahrungsaufnahme und der Paarung auf einem Kurzflügelkäfer (Staphylinidae) als Beutetier der Raubfliege Proctacanthus milbertii Macquart (Asilidae) in Ontario (Kanada) beobachtet. Beide Verhaltensweisen wurden fotografisch dokumentiert. Die gleiche Halmfliegenart fand sich auch auf der Beute (Hemiptera) von Mantis religiosa (Linnaeus). Es handelt sich gleichzeitig um den ersten Nachweis von Olcella quadrivittata in Kanada. The genus Gymnochiromyia Hendel, 1933 is reviewed. Lectotypes are designated for G. inermis (Collin) and G. seminitens Hendel. New data are given on the distribution and morphological variation of the West Palaearctic species and the World species are listed. A key to the Palaearctic species and illustrations of the male postabdomen are provided for the first time. A new species from the Mediterranean, Gymnochiromyia fallax spec. nov., is described. Die Gattung Gymnochiromyia Hendel, 1933 wird einer Revision unterzogen. Für die Arten G. inermis (Collin) und G. seminitens Hendel erfolgt eine Festlegung von Lectotypen. Der Beitrag enthält neue Daten zur Verbreitung und der morphologischen Variationen der westpaläarktischen Spezies sowie eine Auflistung der Gymnochiromyia-Arten der Weltfauna. Es wird erstmals ein Schlüssel für die paläarktischen Arten nebst der Abbildung der männlichen Postabdomina der Spezies gegeben. Mit Gymnochiromyia fallax spec. nov. wird außerdem eine neue Art der Gattung aus dem Mittelmeerraum beschrieben. A first description is given of the puparium of a species of Gymnochiromyia (G. inermis Collin). The functional morphology is compared with that of Aphaniosoma Becker. Erstmals wird das Puparium eines Vertreters der Gattung Gymnochiromyia (G. inermis Collin) beschrieben. Die funktionelle Morphologie wird mit der Gattung Aphaniosoma Becker verglichen. Pupa of Limnophyes gurgicola (Edwards) and larvae and pupae of L. magnus Chaudhuri, Sinharay & Das Gupta and L. nigripes Chaudhuri are decribed from the Darjeeling Himalayas of West Bengal (India). One species, Limnophyes distinctigenitalis described by Chaudhuri et al. (1979) has been put in synonymy (syn. nov.) of Limnophyes magnus Chaudhuri et al. (1979). Ecology of the species is also stated in the paper. Die Puppe von Limnophyes gurgicola (Edwards) und die Larven und Puppen der Arten L. magnus Chaudhuri, Sinharay & Das Gupta und L. nigripes Chaudhuri aus dem Darjeeling Himalaya von West Bengalen (Indien) werden beschrieben. Limnophyes distinctigenitalis Chaudhuri, Sinharay & Das Gupta, 1979 wird als Synonym (syn. nov.) von Limnophyes magnus Chaudhuri, Sinharay & Das Gupta, 1979 erkannt. Strobliola albidipennis is re-examined and Strobliola is found to be a senior synonym of Aprometopis Becker. Five species are transferred to Strobliola: S. australis (Ismay, 1993) comb. nov., S. flavofacies (Becker, 1910) comb. nov. (A. silvestrii Séguy, 1932 syn. nov.), S. hirashimai (Kanmiya, 1984) comb. nov., S. minima (Lamb, 1918) comb. nov. and S. spectabilis (Kanmiya, 1984) comb. nov. Die Untersuchung der Typenserie von Strobliola albidipennis ergab, daß die Gattung Strobliola ein älteres Synonym von Aprometopis Becker darstellt. Fünf Arten werden Strobliola zugeordnet und eine Art als neues Synonym erkannt: S. australis (Ismay, 1993) comb. nov., S. flavofacies (Becker, 1910) comb. nov. (A. silvestrii Séguy, 1932 syn. nov.), S. hirashimai (Kanmiya, 1984) comb. nov., S. minima (Lamb, 1918) comb. nov. und S. spectabilis (Kanmiya, 1984) comb. nov.
A new asteiid species, Phlebosotera maeandrica spec. nov., from Spain is described. Eine neue Art aus der Familie der Asteiidae, Phlebosotera maeandrica spec. nov., wird aus Spanien beschrieben. A new ulidiid species, Otites gradualis spec. nov., is described from Slovakia. Otites gradualis spec. nov. is closely related to O. lamed (Schrank, 1781). Eine neue Art aus der Familie der Ulidiidae, Otites gradualis spec. nov., wird aus der Slowakei beschrieben. Die neue Art ist eng mit O. lamed (Schrank,1781) verwandt. Eremonotus hauseri spec. nov. from Morocco is described and illustrated. It is compared with the other known species of the genus, and a key is given. A key for the Palaearctic genera of the subfamily Apocleinae is presented and the authors discuss the presence of Neolophonotus Engel, 1925 in the Palaearctic region. Eremonotus hauseri spec. nov. aus Marokko wird beschrieben und illustriert. Die Unterschiede zu der bereits beschriebenen Art dieser Gattung werden in einem Schlüssel herausgearbeitet. Ein Bestimmungsschlüssel für die paläarktischen Gattungen der Unterfamilie Apocleinae wird vorgestellt und die Autoren diskutieren das Vorhandensein der Gattung Neolophonotus Engel, 1925 in der Paläarktis. A second European species of Rhegmoclemina, Rh. bellstedti spec. nov., is described from Germany (Thuringia) and its affinities are discussed. Eine zweite europäische Art der Gattung Rhegmoclemina, Rh. bellstedti spec. nov. aus Deutschland (Thüringen), wird beschrieben. Die Beziehungen der neuen Art werden diskutiert. Dolichocephala bartaki spec. nov., a new aquatic dance fly (Diptera, Empididae, Clinocerinae) from the Czech Republic, is described and figured. A comparision of the new species with D. irrorata (Fallén) and D. bellstedti Joost is given. Dolichocephala bartaki spec. 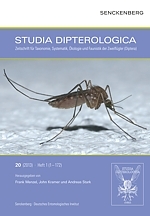 nov., eine neue aquatische Tanzfliege (Diptera, Empididae, Clinocerinae) aus Tschechien, wird beschrieben und abgebildet. Merkmale zur Unterscheidung der neuen Art von D. irrorata (Fallén) und D. bellstedti Joost werden aufgeführt. Six new species of Sciapodinae are described from China: Amblypsilopus baoshanus spec. nov., Amblypsilopus cephalodinus spec. nov., Amblypsilopus sanyanus spec. nov., Amblypsilopus xizangensis spec. nov., Amblypsilopus yunnanensis spec. nov., Chrysosoma hainana spec. nov.
Sechs neue Arten von Dolichopodiden aus der Unterfamilie Sciapodinae aus China werden beschrieben: Amblypsilopus baoshanus spec. nov., Amblypsilopus cephalodinus spec. nov., Amblypsilopus sanyanus spec. nov., Amblypsilopus xizangensis spec. nov., Amblypsilopus yunnanensis spec. nov., Chrysosoma hainana spec. nov.
Stilocladius intermedius spec. nov. from Northeastern China is described and illustrated. A key to the males of Stilocladius is given. Stilocladius intermedius spec. nov. aus dem Nordosten Chinas wird beschrieben und die männlichen Terminalia abgebildet. Es wird ein Schlüssel der Männchen der Gattung Stilocladius gegeben. During a field trip to Southern Switzerland in June 1995, 25 species of Platypalpus were collected, of which 18 are reported here for the first time from Switzerland. A new member of the Platypalpus minutus-group, P. nigricolor spec. nov., is described. Platypalpus aliterolamellatus, P. articulatoides, P. insperatus, P. ochrocera and P. velocipes are illustrated and briefly discussed. Platypalpus, faunistics, Southern Switzerland, Platypalpus nigricolor spec. nov.
Anläßlich einer Sammelexkursion im Juni 1995 wurden in der Südschweiz 25 Arten von Platypalpus gesammelt, darunter 18 Arten die zum ersten Mal für die Schweiz gemeldet werden. Ein neuer Vertreter der Platypalpus minutus-Gruppe, P. nigricolor spec. nov., wird beschrieben. Platypalpus aliterolamellatus, P. articulatoides, P. insperatus, P. ochrocera und P. velocipes werden illustriert und kurz diskutiert. Platypalpus, Fauna, Südschweiz, Platypalpus nigricolor spec. nov. The entire collection of the museums of Leipzig, Dresden, Chemnitz and Görlitz, as well as some recent findings of the genus Brachyopa, consist of 77 specimens of adults in nine species. With the exception of B. maculipennis Thompson, 1980 all the others are found in state of Saxony in the eastern part of Germany. These are: B. bicolor (Fallén, 1817); B. dorsata Zetterstedt, 1837; B. insensilis Collin, 1939; B. panzeri Goffe, 1945; B. pilosa Collin, 1939; B. scutellaris Robineau-Desvoidy, 1843; B. testacea (Fallén, 1817) and B. vittata Zetterstedt, 1834. A discussion of the regional distribution of these species in Saxony, including general information on the plants used during feeding of the adult and larval development, follows. From the collection of the Leipzig Entomological Society, which dates back to the beginning of the century, 11 specimens have been traced from 16 originally recorded samples. Drawings of the the male genitalia of all 9 species and also a key for species determination based on hypandrium and surstylus is given. In den entomologischen Sammlungen der sächsischen Museen in Leipzig, Dresden, Chemnitz und Görlitz konnten unter Einbeziehung aktueller Fundmeldungen insgesamt 77 Imagines aus der Gattung Brachyopa in neun Arten registriert werden. Bis auf B. maculipennis Thompson, 1980 kommen alle in Sachsen vor. Es handelt sich um B. bicolor (Fallén, 1817); B. dorsata Zetterstedt, 1837; B. insensilis Collin, 1939; B. panzeri Goffe, 1945; B. pilosa Collin, 1939; B. scutellaris Robineau-Desvoidy, 1843; B. testacea (Fallén, 1817) und B. vittata Zetterstedt, 1834. Ihre regionale Verbreitung in Sachsen wird diskutiert. Der Verbleib von Sammlungsbelegen Leipziger Entomologen vom Anfang diesen Jahrhunderts konnte in 11 von 16 Fällen aufgeklärt werden. Von einheimischen Brachyopa-Arten werden außerdem Daten zur Biologie, zu bevorzugten Larvalhabitaten und zum Blütenbesuch zusammengestellt. Von allen zur Auswertung zur Verfügung stehenden 9 Arten wird der Genitalapparat der Männchen abgebildet und ein Bestimmungsschlüssel der Arten nach Merkmalen des Hypandriums sowie des Surstylus aufgenommen. Abundance of Diptera emerged from four types of dead wood (a tree stump, white-rot branches [WRB], branches incorporated into the soil [SLB], and fallen twigs) were studied in a beech forest. A total of 95 species was recorded: 75 from the tree stump and 31 from the woody litter. As to the latter, production of adults was highest for SLB in terms of individuals caught but biomass production was highest for WRB, as this is the preferred habitat of a large species, Tipula flavolineata Meigen, 1830. This species was calculated to transform some 9 % of WRB volume to faeces per year. 35.8 % of the species found have also been recorded from emergence trap studies conducted in non-woodland habitats suggesting that association with dead wood is often not obligatory. In einem Buchenwald wurden die Abundanzen der aus vier Sorten von Totholz (Baumstubben, weißfaule Äste [WRB], in den Boden eingesunkene Äste [SLB] und abgefallene Zweige) geschlüpften Dipteren untersucht. Insgesamt wurden 95 Arten registriert, 75 für den Stubben und 31 für die drei Holzstreutypen. Im Vergleich der Holzstreutypen war die Schlüpfabundanz der Dipteren für SLB am höchsten, hinsichtlich der produzierten Biomasse aber für WRB. Verantwortlich hierfür ist Tipula flavolineata, deren Larven innerhalb eines Jahres ca. 9 % des vorhandenen WRB in Kotkrümel verwandeln können. Etwa 36 % der hier registrierten Arten wurden auch in Schlüpffallenfängen von Wiesen und Äckern nachgewiesen; dies legt nahe, daß die Bindung an Totholz bei vielen dieser Dipterenarten nicht obligatorisch ist. During examination of the insects collected by means of emergence traps situated at Upper and Lower Schierensee-brook, a total of 111 species of Empidoidea out of 2 365 specimens could be confirmed. Aquatic species (4) represented 4 % of all specimens. A significant dominance of silvicolous (55) and ripicolous (21) species was evident. These species represented 68 % of all species or 75 % of all specimens. The highest number of species (58) and the maximum average number of specimens (765/1 m� emergence trap) was found at the woodland station USB-4. The structure of dominance was represented by 14 species of Empidoidea. All species with at least 30 specimens represented together about 75 % of all specimens caught. Nine species showed their maximum of dominance at station USB-4 (woodland). The main flight time of Empidoidea at Lower Schierenseebrook (USB 1-4) lasted from May to August, showing a maximum number of 30-47 species in June. Concerning the structure of community of the Empidoidae, evaluated by an correspondence analysis (CA), significant diffences were evident between the emergence trap sites along the Lower Schierenseebrook (USB 1-4). The forest station USB-4, characterised by a huge tree canopy, was clearly different in comparision with the meadow stations USB 1-3 with an alder fringe, planted in 1977. Emergenzfänge erbrachten am Oberen und Unteren Schierenseebach (Schleswig-Holstein) insgesamt 2 365 Individuen von Empidoidea mit 111 Arten. Aquatische Spezies (4) waren mit 4 % Individuenanteil vertreten. Es dominierten silvicole (55) und ripicole (21) Arten, die 68 % aller Arten sowie 75 % aller Tiere repräsentierten. Die Station USB-4 (Hochwald) hatte bei den Empidoidea mit 58 Arten sowie mit durchschnittlich 765 Tieren pro m� Emergenzhausfläche die höchste Arten- bzw. Individuenzahl. Das Dominanzgerüst der Empidoidea mit mindestens 30 Individuen pro Art wurde von 14 Arten mit ca. 75 % aller Individuen gestellt. Die Hauptflugzeit der Empidoidea umfaßte am Unteren Schierenseebach (USB 1-4) die Monate Mai bis August und erreichte im Juni mit 30-47 Arten die höchste Artenpräsenz. Die Überprüfung der Zönoseähnlichkeiten unterschiedlicher Emergenzhausstandorte am Unteren Schierenseebach (USB 1-4) mit einer Korrespondenz-Analyse (CA) ergab deutliche Unterschiede. Die Hochwaldstation USB-4 war am deutlichsten von den Wiesenbachbereichen USB 1-3 mit einem 1977 angepflanztem Erlensaumwald zu unterscheiden. A Malaise trap in La Roche-Clermault (Indre-et-Loire, France) caught 25 species of Sarcophagidae. A bibliographic study increased the records for Indre-et-Loire to 31 species. Mit einer Malaisefalle in La Roche-Clermault (Indre-et-Loire) wurden 25 Arten von Fleischfliegen (Sarcophagidae) gefangen. Zusammen mit der Auswertung bibliografischer Angaben erhöht sich die Anzahl der aus Indre-et-Loire gemeldeten Sarcophagiden auf 31 Arten. The fauna of Ephydridae was studied by using several collecting methods in Southern Moravia during 1994-96. A total of 42 species were observed, 10 of which are discussed here. Four of these species were recorded for the first time in the Czech Republic and 6 in Moravia. Die Fauna der Ephydridae wurde in den Jahren 1994-96 in Südmähren mittels verschiedener Fangmethoden untersucht. Von den insgesamt 42 vorgestellten Arten werden 10 in ihrem Vorkommen und Verbreitung kommentiert. Vier Spezies werden erstmals für das Gebiet der Tschechischen Republik gemeldet und 6 Arten sind neu für Mähren. Mycetophilidae described by Strobl were studied in the Strobl Collection, Admont. As a result the following taxonomic changes are proposed: Trichonta vulcani (Dziedzicki, 1889) = Phronia appropinquata Strobl, 1900 syn. nov.; Trichonta tristis (Strobl, 1898) comb. nov. = Trichonta superba Ostroverchova, 1979 syn. nov.; Phronia conformis (Walker, 1856) = Phronia emarginata Strobl, 1900 syn. nov.; Phronia longelamellata Strobl, 1898 = Phronia minuta Landrock, 1928 syn. nov.; Synplasta gracilis (Winnertz, 1863) = Rymosia tiefii Strobl, 1900 syn. nov.; Exechia contaminata (Winnertz, 1863) = Exechia macrura Strobl, 1910 syn. nov.; Exechia styriaca Strobl, 1898 = Exechia sororcula Lackschewitz, 1937 syn. nov. Furthermore the status of Allodia latelamellata Strobl, 1910 is discussed and lectotypes of Allodia (Brachycampta) foliifera (Strobl, 1910) and Allodia (Brachycampta) triangularis (Strobl, 1895) were designated. Male terminalia of latter species are figured. Von Strobl beschriebene Pilzmücken (Mycetophilidae) wurden in der Strobl-Kollektion in Admont untersucht. Im Ergebnis dieser Studie ergeben sich die folgenden taxonomischen Änderungen: Trichonta vulcani (Dziedzicki, 1889) = Phronia appropinquata Strobl, 1900 syn. nov.; Trichonta tristis (Strobl, 1898) comb. nov. = Trichonta superba Ostroverchova, 1979 syn. nov.; Phronia conformis (Walker, 1856) = Phronia emarginata Strobl, 1900 syn. nov.; Phronia longelamellata Strobl, 1898 = Phronia minuta Landrock, 1928 syn. nov.; Synplasta gracilis (Winnertz, 1863) = Rymosia tiefii Strobl, 1900 syn. nov.; Exechia contaminata (Winnertz, 1863) = Exechia macrura Strobl, 1910 syn. nov.; Exechia styriaca Strobl, 1898 = Exechia sororcula Lackschewitz, 1937 syn. nov. Weiterhin wird der Status von Allodia latelamellata Strobl, 1910 diskutiert und Lectotypen von Allodia (Brachycampta) foliifera (Strobl, 1910) und Allodia (Brachycampta) triangularis (Strobl, 1895) wurden festgelegt. Die Terminalia des Männchens letztgenannter Spezies werden abgebildet.